Hong Kong-born Gordon Tsang immigrated to America with his family when he was 16 and jumped right into his first community-oriented job: summer lifeguard and swim instructor. In 2012, Gordon decided to take an EMT class, which drew him farther into the field of paramedicine. 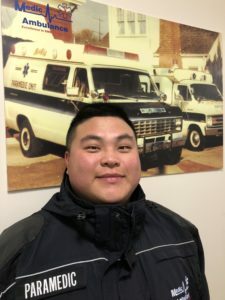 Gordon was hired at Medic Ambulance that same year, and he says, “I was blessed to have wonderful partners and family who encouraged and supported me through my journey as an EMT and my decision to start Paramedic school.” In August 2016, torn between nerves and excitement, he became a Paramedic in Solano County. Gordon is always excited to pass on his knowledge to new EMTs and Paramedics. He is being recognized as Medic Ambulance Solano Division 2018 Paramedic of the Year for his excellent performance as an FTO/Paramedic in Solano County. Gordon and his partner Dominic were an integral part of Medic’s response during the devastating Napa and Sonoma fires. They worked countless hours and were part of three different strike teams sent to the impacted areas. Gordon and Dominic helped evacuate 65 patients from the Santa Rosa skilled nursing facility.